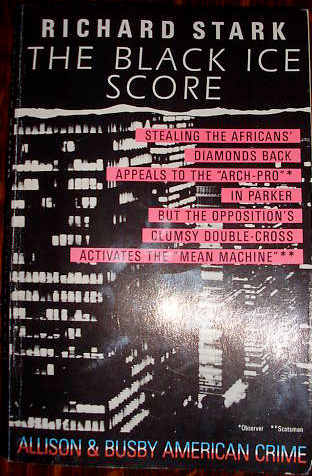 The Allison & Busby 1986 paperback of the eleventh Parker novel, The Black Ice Score. I did think I might get the hardback of this one for my recent birthday, but some other bugger bought the copy I'd identified before it could be bought for me. Never mind – this paperback'll do just fine. I'm halfway through reading Parker #4, The Mourner, which is a little different to the previous books. There's a character in it, Menlo, who seems more like a character from a spy novel than Stark's usual hard-bitten cast. But the writing's as poetically matter-of-fact as ever, with lots of those lovely economical sentences, often broken at a rightangle halfway through by a comma, almost like really good song lyrics. I should probably write something about the previous Parker, The Outfit, at some point, but maybe I'll leave that till I've watched the movie, and then compare the two.